DREAMS have turned into reality for two local men after they graduated from the Department of Fire and Emergency Services’ Firefighting School. 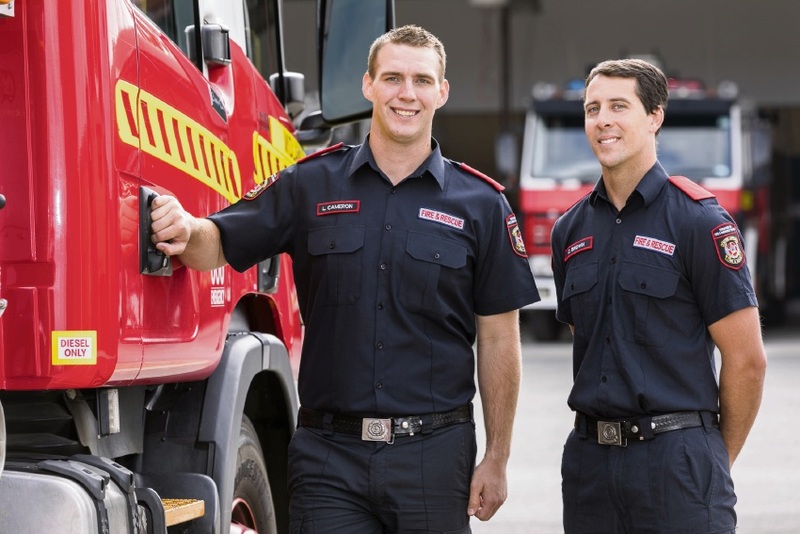 Cameron Brown, of Henley Brook, and Luke Cameron, of Aveley, were part of a 24-strong group of WA’s newest career firefighters – timely additions to the DFES team as bushfire season begins. “Firefighting has been a life-long dream ever since I was about eight years old,” Mr Brown said. “It was just about making sure I was mature enough before I made a career out of it. Mr Brown started his own electrical business five years ago, but said his new career was now his focus. “My dad is my role model because he is also a firefighter (and station officer) based in Ellenbrook,” he said. “When I was growing up I spent a lot of time interacting with the brigade. A former mines worker in the Pilbara, Mr Cameron said firefighting became his dream about two years ago. “I was looking for a career change,” he said. “I was working on the mines as a front end loader, which basically means I loaded crushed iron ore on to road trains to go to Port Hedland. “A friend introduced me to a firefighter who said he loved his job and how rewarding it was. Fire and Emergency Services Commissioner Wayne Gregson said it took a dedicated person to serve and protect others. “Our men and women face challenging situations every day as they turn out to emergencies and need to act quickly under trying circumstances,” Mr Gregson said. Mr Gregson said the graduates were trained and ready for the bushfire season and called on the community to prepare too. Mr Brown has been posted to the Belmont brigade, while Mr Cameron will start his career at the Kiara brigade. “I started on Wednesday,” Mr Brown said.